Life has been picked up, shook up and scattered all over the floor. Nothing is quite the same. All of a sudden, I'm a mother of two. I have a gorgeous little (big) baby girl to cuddle and my sweet big girl isn't here for lunch anymore. It occurred to me yesterday that I don't see my big girl much anymore. She wakes early and plays downstairs with her daddy while I'm busy catching up on sleep after a late night party with the littlest. She eats her breakfast, gets dressed into her uniform, brushes her teeth, runs in to kiss her baby sister goodbye and then disappears out the door. And then I have to wait six and a half hours until I can see her again. And in those six and a half hours she plays, she reads, she eats. She does all of the things we used to do together, only now I'm not there to join in. And finally 3 o clock crawls round and I can go and pick her up. Her face lights up when she sees her baby sister in the wrap and she runs over to tickle her feet. We have a few hours before bedtime. But those hours are often dotted with tears. The transition to schoolgirl isn't easy, the days are long and she is exhausted when she gets home. I'm hoping this will get easier as she adjusts to the longer days and the routine of school. It feels unfair that the little time I get with her now is littered with meltdowns and tiredness. Then all of a sudden it's time for dinner and bed. And our time together is over for another day. Ocean finance very kindly let us choose some back to school goodies to ease the financial burden of the start of school. Isn't it crazy how much you end up spending on school stuff? 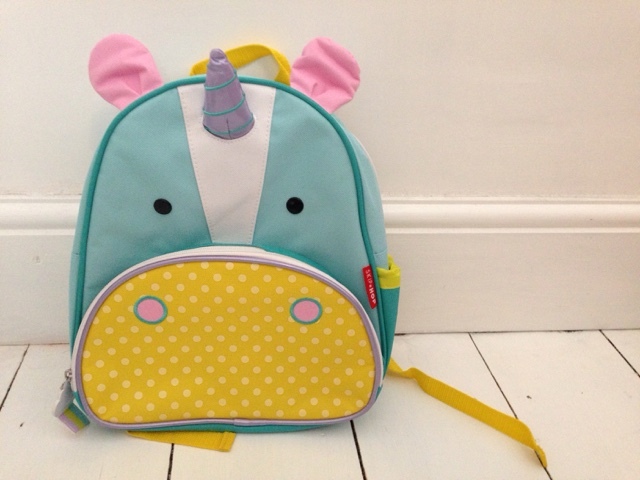 My favourite purchase was the unicorn backpack pictured above. Ebony doesn't even need a backpack for school because she has a book bag, but it was too cute not to buy. Ebony loves unicorns so this was an immediate hit.